Phil Freedman was an American that grew up in Japan. Having soaked in the Japanese culture for years, Phil made a living of liaising for U.S. firm that wanted to do business in Japan. Albert Friedman, his big brother worked at Olympic Radio before being hired as the president of Delmonico International a stereo and television company. In July 1968, the two brothers founded APF Electronics Inc. The name APF come from the initial of the two brothers. The company started by importing audio/video equipment from Japan including stereo, radio, amplifiers, record players, television sets, etc. By 1972, APF Electronics was a leading manufacturer of electronic calculators. They were building more than 70% of all calculator sold in the stores such as Sears and Montgomery Ward. In 1976, General Instrument released the AY-3-8500 chip, a chip that could play six pong-like games. Prior to this concept of pong-on-a-chip, video game manufacturer had to create the integrated circuit from scratch using discrete transistor logic instead of a microprocessor. The process was complex and costly which explain that only a few video game consoles were created before 1976. With the release of the AY-3-8500 chip, tech companies could now create simple and affordable video game console. As did Coleco with the Telsar series, APF decided to release in 1976 its first pong-like console named APF TV Fun. In the first year, more than 400,000 units of the APF TV Fun were sold, leading APF to develop other models. By 1977, APF Electronics had released six other models. 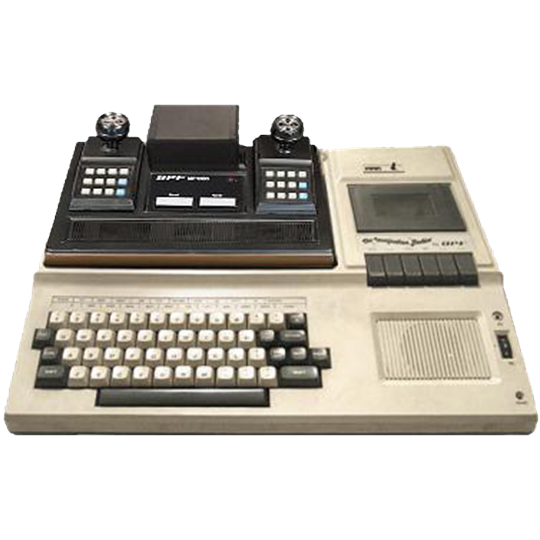 After the release of the Fairchild Channel F in 1976, APF saw the potential in cartridge-based video game console and in 1977, they decided to work on its own. APF appointed Kenneth Boilen to lead the design team while Ed Smith, one of APF engineer, was put in charge of designing the prototype for the console. Around the same time, Irving Boilen, APF’s head of engineering led the design of the PeCos One, the first personal computer made by APF. Short for Personal Computer One, the computer used the JOSS Language (an acronym for JOHNNIAC Open Shop System) instead of the popular BASIC language. This choice was not well received by the consumers and the PeCos One was quickly discontinued. The design of the MP1000 was advancing quickly. In less than six months and with the help of the design team and engineers of the Hong Kong office, Ed Smith managed to develop the electronic design for the prototype. During that period APF management heard that Mattel was planning a computer add-on for their upcoming Intellivision console. With their recent entry in the personal computer world, APF decided to also produce their own personal computer add-on for the MP1000. Called MP1000 for MicroProcessor, the console was released in mid-1978. The console came packed with 1 built-in game called Rocket Patrol. The console did fairly well at first, but received mixed reviews, especially in regards to the games. Almost all games were developed by Harry Cox as AFP didn’t have the money to hire a second developer. Like it was the case for the Fairchild Channel F and the RCA Studio II, APF decided to play safe and release games based on existing sports or board-games while Atari developed creative new ideas and IP for their Atari VCS (Atari 2600) console. As the sales of the MP1000 were slowing down, APF were ready to release their personal computer extension. Almost a year after the release of their console, APF released the Imagination Machine. Although less powerful than the other personal computer of the time like the Apple II, the Imagination Machine was sold for $599, less than half the price of the Apple II. The Imagination Machine used the Motorola 6800 CPU of the MP1000 and came bundled with the console (renamed M1000). If you already had the console, you could purchase the Imagination Machine for $499. A lot of external peripherals like floppy drive and printer were also available from the stars. Although well received by journalists, the Imagination Machine was not well received by the public. This is mostly due to the fact that APF decided to sell this computer using the same channel as the MP1000. This means that store clerks with no technical background and qualification were tasked to sell a fairly complex product. With no understanding of the inner work, customers were very uneasy to the idea of having a video game machine performing serious task like their personal finance. Another problem was the inclusion of a tape drive directly in the system. Apple had just released their Disk II Drive making the Imagination Machine fell a bit outdated. In the end, APF were able to move fewer than 20,000 units. Wanting to distance themselves from the “toy” feel of the Imagination Machine, APF designed an updated version of the computer called the Imagination Machine II. The new models included the circuitry of the M1000 directly in the devices and added more memory, which makes the device look more professional. By January 1981, the Imagination Machine II was presented to the Consumer Electronic Show, but didn’t generate a lot of attention. APF had spent a lot of money in developing the MP1000 and the Imagination Machine and now had more than $7 million in debt. The bank didn’t think the Imagination Machine had a future especially since the release of the IBM Personal Computer in August 1981. The video game industry was still perceived as a fad so the bank asked APF to center their activity around the calculator line which was still successful or for the immediate reimbursement of the loan. The APF management refused to change their strategy and gave the company to the back which proceed in its foreclosure. The MP1000 came with a built-in game called Rocket Patrol. 12 other games were released for the console at a suggested retail price of $29.95. The game “Space Destroyers” is by far the most collectable cartridge game for the systems. The game is a very faithful Space Invaders clone and it’s the only game to come in a long cartridge format. Since the Imagination Machine used the MP-1000/M-1000 CPU and RAM, there technical specification are identical except when noted otherwise. The Imagination Machine had several peripherals available on release day. The appeal of the Imagination Machine was its low cost. Adding multiple peripheral would make the price of the machine significantly higher which would make them a less appealing option than the high-end machine like the Apple II. Because of this, the peripheral for the systems are extremely rare. Building block $200—An extension needed to plug multiple peripherals.